Cathy Jo Cress is nationally known in the field of aging. She wrote the first book on geriatric care management, Handbook of Geriatric Care Management (Jones and Bartlett, 3rd ed. December 2010). 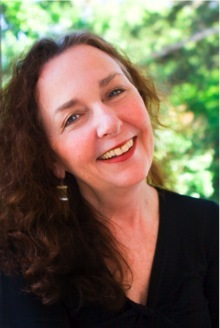 Her book, Care Managers: Working with the Aging Family (Jones and Bartlett), was published in August 2008. She is an expert in geriatric care management based on both editions of Handbook of Geriatric Care Management, considered the bible of this field. Handbook of Geriatric Care Management, 2nd edition. Jones and Bartlett, February 2007. 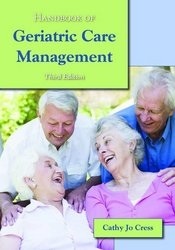 Handbook of Geriatric Care Management. Jones and Bartlett, 2001. “Geriatric Fiblets—Necessary White Lies or Bad Therapeutic Technique? 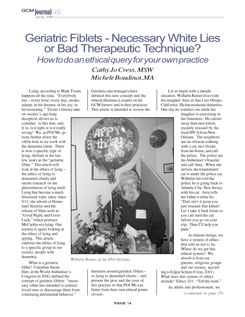 How to Do an Ethical Query for Your Own Practice,” GCM Journal, Spring 2006. “Aging Peter Pan,” Journal of Case Management, August–September 2004. “Communicating with Older Adults.” Reviewed by Cathy Cress, Contemporary Gerontology, Springer Publishing, Vol. 10, No. 10, 2003 “GCM on the Case—Case Management Moves into the Geriatric Age,” Home Health Dealer Magazine, Summer 1997. “Geriatric Care Management and Managed Care: A Win-Win Combination,” GCM Journal, Summer 1996. “Geriatric Care Management and Managed Care,” Current Concepts in Geriatric Managed Care, October 1996. “Care Managers—A Resource for the Sandwich Generation,” GCM Journal, Spring 1994. “Training, the Key to Home Care Aide Career in Aging,” GCM Journal, Winter 1994. “Case Managers, Care Providers and Clients—Women Are the Problem and Solution in Aging,” GCM Journal, Winter 1992. “CM of the Frail Elderly: A ‘Caring Agency’ Model,” The Case Manager Magazine, Vol. 3, No. 1, February 1992. “Case Management, Custodial Care Are Packaged Together in Nurse/Social Worker Team Program,” Case Management Advisor, December 1992. “The Business of Case Management Flourishing in the United States,” Aging International, September 1992. “Home Equity Conversion and Seniors Prolonging the American Dream,” Caring Magazine, Vol. X, No. 2, February 1991. “Entrepreneurial Human Service: Can Business & Caring Coexist?” Caring Magazine, Vol. X, No. 10, October 1991. “The Value of Marketing: For Your Practice and The Consumer,” Geriatric Care Management Journal, Vol. I No. 4, Fall/Winter 1990. “Marketing Your Business: How to Make The Investment That Brings Returns,” Case Management Advisor, December 1990.